The all-local CITY65 Music Festival is returning for its second edition this weekend. CITY65 have once again curated a purely local line-up, featuring notable names in the local scene like The Steve McQueens and JAWN. Spread over two stages on a single day, the festival will see a total of 10 artists performing, including Retrofocus, The Betts, Terminal Cry, Addy Cradle, Instigator Afrobeat Orchestra, Lincoln Lim, Randolf Arriola and General Lee. The Electric Stage and the Living Room Stage will be headlined by Addy Cradle (aka guitarist Addy Rasidi) and JAWN respectively. The complete list of performances can be found below. 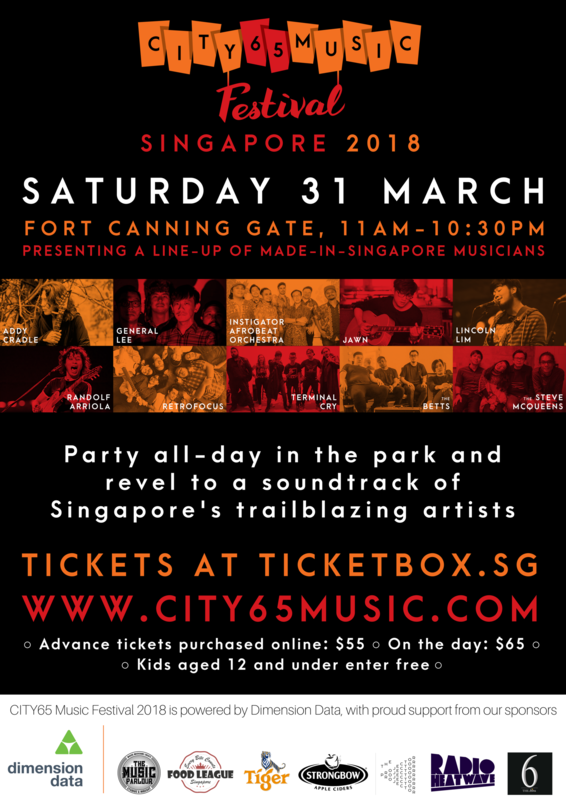 CITY65 Music Festival 2018 will take place on Saturday, 31 March from 11am to 10:30pm at Fort Canning Park. Tickets for the event are going for S$55, with a 4 ticket bundle available for S$200. Get your tickets here.